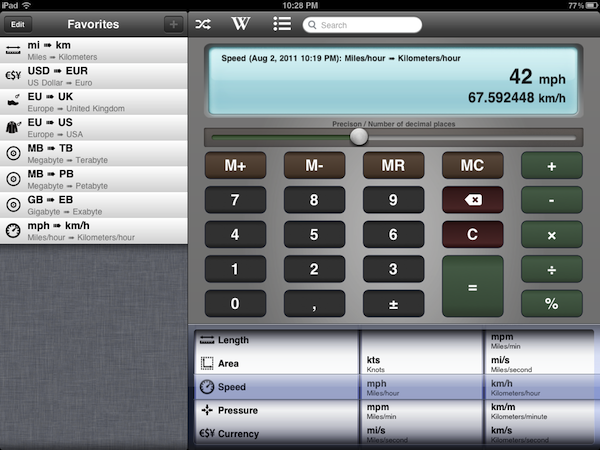 Back in 2009, I installed a simple currency and unit conversion utility on my iPhone called Measures. Developed by Michael Neuwert, I remember Measures as one of the first "popular" converter apps for the iPhone, one that actually managed to move thousands of sales back when the App Store was still relatively small. Two years and hundreds of thousands of app later (let alone the iPad and two new App Stores), Measures is coming back with an HD version built specifically to take advantage of the iPad's screen. Retaining the same icon and UI color scheme of its iPhone counterpart, Measures HD packs 170 currency exchange rates (constantly updated over the air) and 1000 different units, organized in 40 categories. I like Measures HD not because of its design, but because it's functional. Measures may lack the amount of polish seen in any Tapbots or Iconfactory app, but as far as the actual unit and currency conversion goes, Measures works better than anything else I've tried on the iPad to date. There are two aspects of the app that truly stand out to me: the Favorites sidebar, and the fact that Measures doesn't stop at normal units like those pertaining to length, area, speed, or temperature. 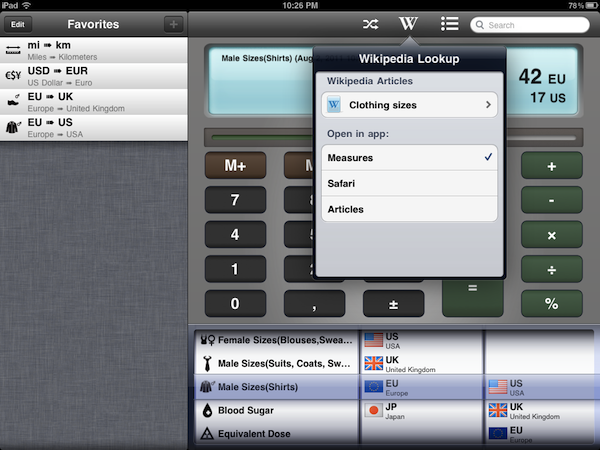 Measures adds dozens of categories ranging from Male Shoe Sizes and Data Storage to Radioactivity, Male Sizes for suits/coats/shirts, and Typography. 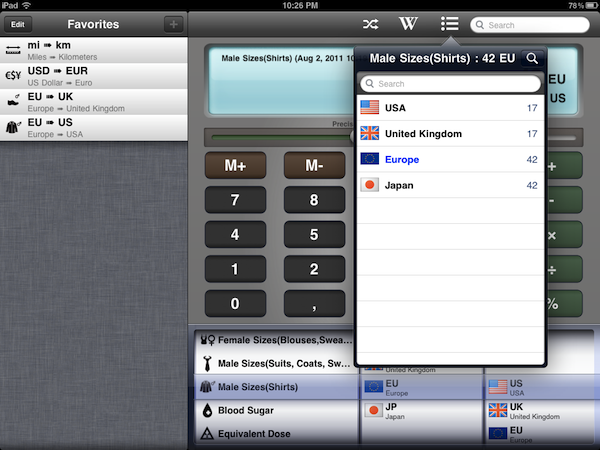 With all these types of "units" available at your fingertips, Measures lets you convert, say, a European shoe size to a UK or US one, or your milligram/deciliter blood sugar level to millimol/liter. And again: you can easily convert megabytes to yottabytes, short tons to pounds, and obviously US Dollars to Euros and other currencies as well. Measures' unit database is huge, and if it's not the biggest one on the App Store yet, then it definitely get very close to it. Whilst most converter apps focus on providing a fresh interface for the usual units and currencies, Measures sacrifices some attention to the overall design (I don't like the slider to adjust decimals and the looks of the keypad -- but this is just personal taste) to focus on "real life usage" with options like the aforementioned shirt sizes, or fuel consumption and data storage. This is the kind of stuff I always need to check (especially when buying some cool t-shirt from a website that doesn't list EU sizes), but that very few apps provide. In fact, most of the times I'm forced to look it up on Wikipedia. Speaking of which, Measures HD comes with a Wikipedia search function to look up the selected unit on the website's database. Multiple Wikipedia articles (when found, otherwise it's just a single one) are listed inside a popover, and you can decide to open the webpage within Measures, in Safari, or in Sophiestication's Articles. Next to the Wikipedia button in the top toolbar, there's also a "list" icon to see all converted results without being restricted to a single conversion. Another nice feature is the Favorites sidebar, which enables you to save any conversion for quick access at a later time. If you find yourself converting Euros to Dollars pretty often, you might want to consider saving that conversion as a shortcut in the Favorites so you won't have to use the (gimmicky) unit picker at the botton; Apple itself suggests in its Interface guidelines to use a "date and time picker" for iPad inside a popover rather the main screen -- I agree, as the result is not really pleasant in Measures and it feels unresponsive if your finger runs down to the iPad's bezel. Overall, I enjoy having Measures on my iPad because it's useful. The app could use some UI refinements and re-thinking, but as it stands now it is the converter app for iPad with the largest array of options I've seen so far. You can download Measures HD at $1.99 on the App Store. Check out more screenshots of the app after the break.